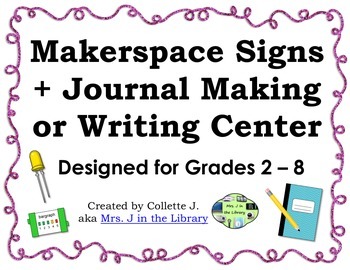 This product is for managing a makerspace in your library, computer lab, or science room. 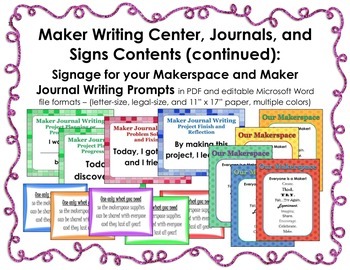 You can use these signs, journals, and notebooks to encourage students to track and write about their project as they work through the making process of Plan, Make, Improve/Reflect. Download the preview for full contents! 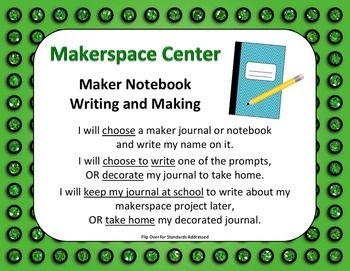 A makerspace (also called a maker space, hackerspace or fab lab) is where students can create, think, problem-solve and have fun. To get an idea of what that can look like in a library or school, watch this video or look up Maker Faire on YouTube. After watching a few of the videos, you’ll get an idea of what the maker movement is about. • 3-5-ETS1-1. Define a simple design problem reflecting a need or a want that includes specified criteria for success and constraints on materials, time, or cost. • 3-5-ETS1-2. Generate and compare multiple possible solutions to a problem based on how well each is likely to meet the criteria and constraints of the problem. 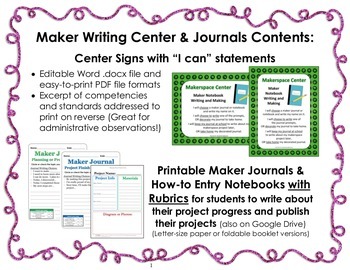 Makerspace littleBits (TM) Task Cards FREEBIE!